By 2001, I'd already been playing the Drummstick, (my analog-MIDI drum controller), for 7 seven years, and in August of that same year, I finally got the chance to debut the first ever Drummstick album with a CD release show at the State Theater in Falls Church, Va. Joining me were my regular bandmates, (Celia DuBose, Neil Mezebish and Jack Wright), and some special guests, Siobhan Canty, Neeta Ragoowansi, Eric Dahlman, Carlos Martins, and the Indian percussionist Sandip Burman. Burman nearly stole the show with his incredible tabla playing, and rightly so, as he was also on tour with Bela Fleck and the Flecktones promoting their "Outbound" album with Andy Narell, Paul Hansen and Paul McCandless. The next day, we took Burman to Wolftrap, Va. to rejoin the tour with Fleck and the Flecktones. It was there that I first met Roy "Futureman" Wooten, off stage after a great sound check. Wooten and I spoke at length about the Drumitar, (his $10,000 customized/cannibalized SynthAxe guitar synth, turned into a drum controller); my Drummstick; triplet hand patterns to play; using MIDI; it was both an insightful and illuminating experience. By then, I'd also gone through the trials, tribulations and joy of trying to obtain patents, and faced the reality of the costs, headaches and heartbreaks, associated with making and marketing the Drummstick. Curious, I asked Wooten why he never tried to manufacture his own version of the Drumitar, or something akin to it; he certainly had the money; the notoriety and the platform to promote it. Wooten looked at me, smiled and said, "You already know why... Do you really want to spend the time and money on attorneys and running a business, or do you want to do what we do best? Play music with these cool instruments... Let someone else do it..." As it turned out, that someone else was David Haney and his custom Zendrum shop in Atlanta. Haney had created a fabulous, MIDI percussion controller: the Zendrum. Affordable, durable, responsive and light; it could even be used with a wireless box. It's approach however, was more horizontal, and worn like a guitar. 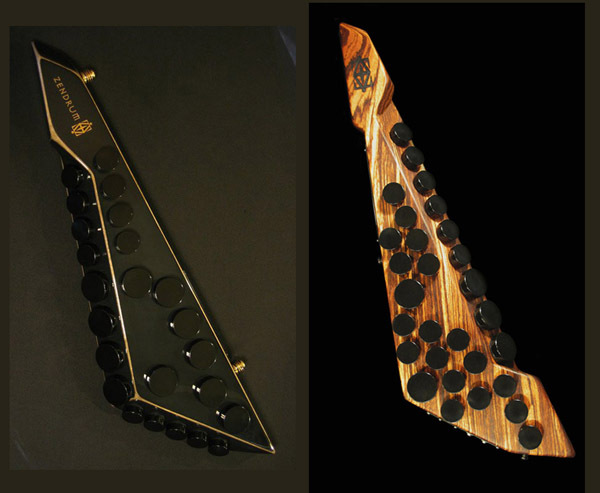 Wooten also owned and used them live; but he actually played it vertically, or used it horizontally on a stand. Neil "Mez" Mezibish, the saxophonist of my Drummstick band, actually surprised me one day and showed me a lovely maple Zendrum ZX he just bought; he then let me program it and try it out. I immediately flipped the Zendrum to a vertical position, and tried to work with it. One thing I was never able to do, was play the Zendrum in the normal, horizontal position; too many years on the Drummstick made that a bit too awkward for me. The straps weren't in the best place to play it vertically, but I resolved to move them if I ever had one. After 20 minutes or so, I'd programmed the Zendrum to a playable level; it was so incredibly responsive and amazing; I immediately loved it. By 2007, the Drummstick had long since realized its analog to MIDI potential, and so I finally made the switch. The Zendrum proved it was better in virtually every way except one; it was designed to be played and worn horizontally, like a guitar. My Drummsticks were played vertically, much like the 10-stringed bass guitar, the Chapman Stick. Nevertheless; Haney built me a custom, black Zendrum ZX, modeled after Jimi Hendrix's black Fender Stratocaster. Undaunted, I removed and replaced the straplocks to different places on the Zendrum, so that I could play it vertically. I'd seen Wooten do the same thing with one of his Zendrums earlier, so I knew it could be done. Voila, worked like a charm and I have to say that I honestly haven't played any of the Drummsticks much since. Still, as much as I loved the Zendrum, I loved the ergonomics of the Drummstick more; it was more natural for me to play that way; African talking drummers played that way, and so did singer Bobby McFerrin when he drummed on his torso during a duet with Wayne Shorter. 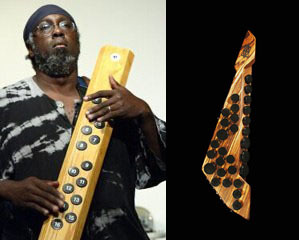 Seeing Bobby McFerrin, those African drummers and Chapman Stick players like Alphonso Johnson and later Tony Levin, gave me the idea for the original Drummstick back in 1994. For years, I'd secretly hoped Haney would make a Zendrum with a vertical approach in mind, like a Drummstick. Enter the new Zendrum EXP.